From the initial downbeat of the overture to the final moment when the newly-reunited lovers clasp hands under a dining table, it was some enchanted evening. And I’m not just saying that because it’s convenient or cute (although it is). The Lincoln Center production of Rodgers and Hammerstein’s “South Pacific” has opened at San Francisco’s Golden Gate Theater and for some it was a wonderful walk down Memory Lane; for others, an introduction to what just might be the greatest American musical ever to grace a stage (apologies to “Oklahoma” and “Carousel”). This 2008 revival, directed by Bartlett Sher, won seven Tony Awards, proving that the 60-year-old show, with its themes of racial prejudice, wartime tension and love between people of disparate backgrounds still resonates with audiences. It also proved that the Tony Committee had its head screwed on straight for once. This is an exquisitely realized production, well-performed, fast paced, fun and beautiful to behold. A strong cast – although not the original – ensures that the national touring version will not disappoint. Then there are the songs: the aforementioned “Some Enchanted Evening,” “Bali Ha’i,” “Bloody Mary,” “There is Nothing Like a Dame,” the lovely “Younger Than Springtime,” and one that had been cut from the original production, probably for length, “My Girl Back Home.” They come fast upon one another with just enough dialogue to move the plot along; bringing the show to a place just on the cusp of Broadway and opera. Another, “You’ve Got to be Carefully Taught (to hate and fear),” carries the show’s message of racial misunderstanding, extremely radical for its time and, unfortunately, still relevant today. For the few who may not know, the story of “South Pacific” revolves around the love between Nurse Nellie Forbush, the “Cockeyed Optimist,” a hick from Arkansas, and the mysterious French plantation owner Emile de Becque. Although they have little in common, they succumb to mutual attraction until Nellie discovers that he has two children (the adorable Christina Carrera and CJ Palma) by a Polynesian wife, now dead. She can’t handle it and determines to “Wash That Man Right out of My Hair.” A parallel and intertwined plot pairs the Princeton-educated Lt. Joe Cable with the lovely island girl Liat. The only thing they have in common, including language, is their hopeless love. Carmen Cusack (“Wicked”) is Nellie and, when she opens her mouth to sing it is as if the late, great Mary Martin was with us again. It’s not an imitation but almost a channeling of the original star. Cusack is very, very good. Hunky baritone Rod Gilfrey (Andre Previn’s “A Streetcar Named Desire”) is de Becque, a role famously originated by the late Ezio Pinza, one of the earliest crossover opera stars. While a French accent sits a tad awkwardly on Gilfrey’s American tongue, he certainly looks the part and his voice is magnificent. There is real heat between the planter and the nurse. Anderson Davis is Cable; dancer Sumie Maeda his Liat and they make a handsome couple. Cable has some of the show’s best songs, including the new one and Davis delivers them beautifully. Liat’s mother, the infamous Bloody Mary, a Tonkinese woman who peddles grass skirts, shrunken heads and anything else she can find to the souvenir-seeking Seabees is Keala Settle and to her is given the haunting “Bali Ha’i.” Speaking of “Bali Ha’i,” a romantic off-limits island looming on the horizon, brings us to Luther Billis, the enterprising Seabee who only wants to get over there – or anywhere (the tedium of waiting around for something to happen in wartime is eloquently projected in this show). Billis, who runs the local laundry, bathhouse and a souvenir manufactory in competition with Bloody Mary, is a good-hearted screwup with a major crush on Nurse Nellie. As played by Matthew Saldivar, he is one of the best things in this very good show. His numbers with the other guys: “Bloody Mary,” “There is Nothing Like a Dame” and, with Nellie, the bawdy cross-dressing “Honey Bun,” are the comic highlights of the show. The cast also features Gerry Becker and Peter Rini as the military brass. The quickly-changing sets are by Michael Yeargan, costumes by Catherine Zuber and lighting by Donald Holder, Tony Award winners all, as was director Sher and for good reason. The large pit orchestra is ably conducted by Lawrence Goldberg. 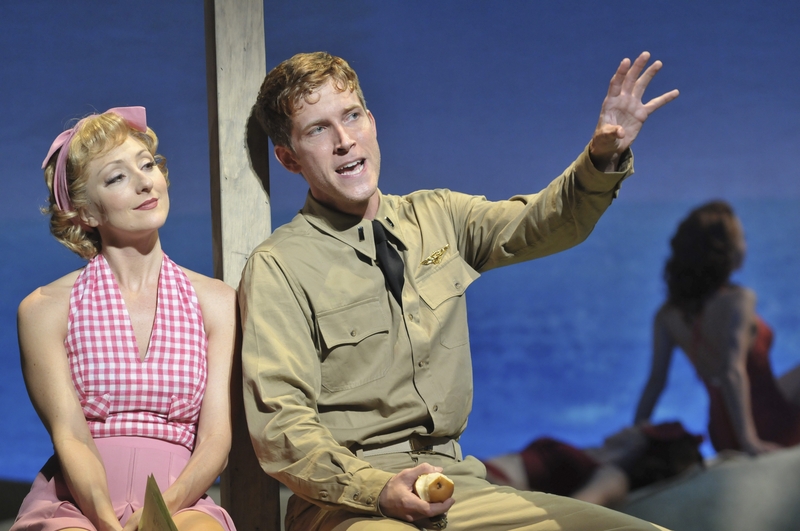 “South Pacific” is a big show, in every way, as noted before, almost an opera. Fast moving, funny and laden with terrific songs and dances, it reminds us of what Broadway can be at its very best. Rodgers and Hammerstein would be proud.